Factory reset option might be the last hope action to activate when your Smartphone starts behaving abnormal or messing up with some apps. This techniques is commonly used by users so also applies to the Samsung Galaxy S5. Techniques and procedures for performing Factory Reset or restoring your phone to default settings on Android platform is different from phone to phone. 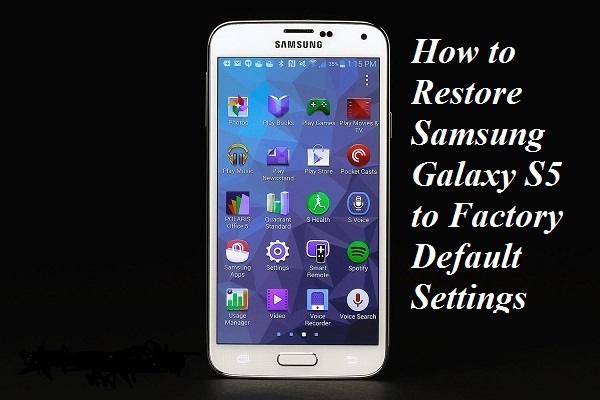 Therefore, today am going to show you,”How to Factory Reset Samsung Galaxy S5”. You can easily follow this guide in order to factory reset your Samsung Galaxy S5 with ease. You need to follow the steps with great care in order to avoid any error which may occur. Below are two steps or methods for this in order to provide you the best convenience. Note: Backup your Data before Applying the Below Steps. >> This is the simple and most simple method which could be used to Factory Reset Samsung Galaxy S5 using the same traditional method. Get to the steps to explore more about it. >> First of all, go to Settings and then go to Backup and Restore section. >> Now, in the bottom look for Factory Data Reset. >> Tap on it and confirm the factory reset. This is an alternative method for most critical cases. If your phone is completely messed up and it is taking much time for opening and all then you must try this method for Factory Reset. >> Get to the below steps to explore more about it. >> First of all, turn off your Samsung Galaxy S5. >> Now, Press and Hold Power, Volume Up and Home Button. >> Keep holding until you enter into a recovery mode. >> After that, use Volume button to move up and down and move towards the Wipe data/factory reset and then hit the power button to confirm. >> Afterwards, you need to select the Yes using the Volume key and then move towards the Reboot System Now. Above steps are the best tricks to quickly reset your Samsung Galaxy S5 to default setting.